How can I import data from MiniScan EZ (and ColorFlex EZ) directly into EasyMatch QC? Yes, if you have a MiniScan EZ or a ColorFlex EZ you can use the EasyMatch QC software to download your Data log from the instrument. To do this, connect the instrument to EasyMatch QC software. Go to ‘Sensor/ Install/Configure’ and select your instrument and the proper COM port (usually the highest number available.) To connect to the instrument you will need to make sure that it is turned on. Once you are successfully connected to the instrument you can download the Data log. To do this go to ‘Sensor/ Import Logged Reads’. A new window will open and you will need to click on the Retrieve Data in the lower left of this window. The window should populate all of the readings from the Data log. You can use the ‘Select All’ button to select all of the readings or to select individual readings to import. 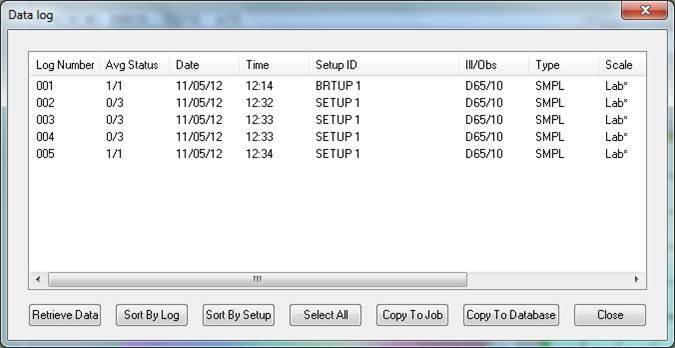 Then either select ‘Copy to Job’ or ‘Copy to Database’ depending on your preference.